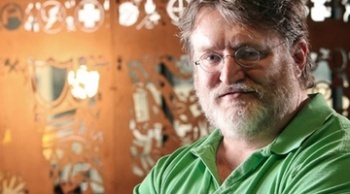 Gabe Newell: "Our Goal Is To Make Greenlight Go Away"
Gabe Newell says Steam Greenlight has been useful but he doesn't want to keep it around forever. Steam Greenlight has been the kind of mess that only Valve can make: inherently flawed and yet wildly successful. Making the cut on Greenlight has become a priority goal for virtually every indie developer in the PC game, yet Greenlight itself is the subject of complaints from all corners, at least in part because its actual workings remain a dark and arcane mystery. Like it or not, it's become a very big part of how Steam works, yet Valve Archduke Gabe Newell made it clear during his address at Steam Dev Days that it's not going to be around forever. "Our goal is to make Greenlight go away," he said. "Not because it's not useful, but because we're evolving." Evolving into what, exactly, remains to be seen, but the great and frequent waves of games getting approval suggests that perhaps the system has succeeded a little too well. It's also possible that Steam's apparently-runaway growth is making Greenlight too unwieldy to be practical: Valve announced today that the number of active Steam accounts increased by 15 percent over the final three months of 2013, from 65 million to 75 million, and while more than 80 percent of Steam revenues for the year were split virtually evenly between North America and Europe, both Russia and Brazil showed very strong year-over-year growth of 128 percent and 75 percent respectively.